Oh I am cheering you on and you will feel so much better.....although starting to work out is just the beginning to making a life change. I lost weight going to Curves but soon realized that I had to continue with at least 30 minutes of exercise every day as well as make good food choices....it was all worth it once I made the commitment....you can do this and we all will benefit the results as we read your blog from a healthy Roman Catholic Cop. Good luck to you! 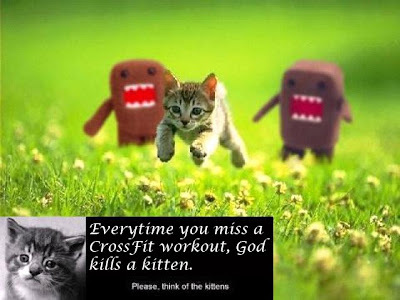 You are going to love CrossFit. I have been a CrossFit Trainer for two years now, and it has changed me. Not just physically, but also in making me really examine the way I live my life and how my family experiences life. I have actually rediscovered my Catholic faith by this process. You are so right that the spiritual and the physical are tied together. You cannot get strong in one without the strength of the other, and by strength I am not talking about physical ability. The mettle of a person is their most defining strength. Good luck! I used to be in great shape...I have had a hard time getting back at it after my last baby (he turns 1 on Saturday!!!) But I need to get back at it. I'll keep you in my prayers...keep me in yours? I will need it to get going again!! Thank-you Pili. I've found that a spirtual advisor is very much like a trainer.